Surely, one of the most bizarre games in the storied histories of both the Dallas Cowboys and the Green Bay Packers occurred on Sunday – with what could be lasting effects on both sides. One team is rushing to inexplicably work its way back to its division title thanks to that miracle and the foot of Ravens kicker Justin Tucker. The other team now has its back squarely against the wall and observers are sifting through names to see who Vegas might place as the favorite to become its next head coach in the next month. This is a game, from a Dallas standpoint, that shows us that a coaching staff must all be on the same page and enjoy a global view of the best way to win a game. This is why I think Jason Garrett committed the unpardonable sin by allowing his offense to play recklessly with the clock and expose his defense to 5 drives in the 2nd half – of which Green Bay found 34 points. For the offense to abandon the run – especially leaving it up to the QB to decide – and trot the defense out again after playing as well as they possibly could in the first half just seems to demonstrate that one hand is seldom aware of the other hand. Then, the defense, after doing a nice job for most of the game kept allowing Matt Flynn and Andrew Quarless to put on a 3rd Down clinic against a Cowboys blitz that has not been effective all year. As we discussed last week, thanks to their owner and general manager diagnosing that he would want to blitz more, the Cowboys blitzed more early on. And although there are a number of other issues to the game, it might be interesting to examine how poorly that went. I expect the Cowboys will blitz more than they have all season on Sunday against a team that has one win in their last 6 games. It might work, because Green Bay has very little self confidence and you could certainly argue they are ripe for the picking – especially if #12 isn’t under center for them. But, the larger issue here is that they are about to do something (blitz more) that A) they are very poor at (as mentioned above, they are the single worst blitzing team in the entire sport, B) they just fired a guy who is great at blitzing, and C) they just hired a guy who has never believed much in blitzing at the expense of weakening his coverage options. So, they will do it and it might even work reasonably well in the small samples, but there has never really been anything that seems more predictably awful for this team to try than to play a “we just need to take more risks” defense. It might fall under the “its so crazy it just might work” heading, but there is no sustainability here and certainly no magic page in the playbook that you turn to when you just want more turnovers. If that page existed, it would be used every week. And when we look at the bad things that happen when the Cowboys do decide to blitz, what are those? Well, it starts with bringing 5 or 6 at the QB, which shows us that there is generally only one possible coverage behind that, which is a 1-deep, man under. And who is playing the man to man underneath? Jeff Heath, Cam Lawrence, and even George Selvie. That is why the Cowboys were pulled down on Sunday repeatedly by a guy named Andrew Quarless, who before Sunday was most famous for breaking Joe Paterno’s leg back when he was at Penn State. NFL QBs are 67 of 101 for 952 yards and 5 TDs and just 1 INT against the Cowboys blitz this year for a stupendous QB rating of 109.1, which would rate them dead last in the NFL at 32nd in a 32 team league. 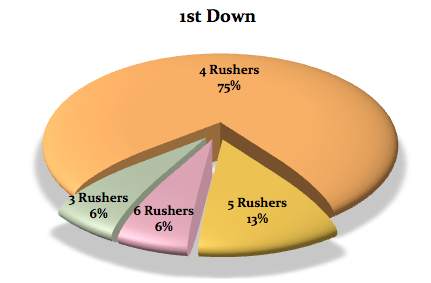 So, on Sunday, the Cowboys tried 10 blitzes. One resulted in a sack by Orlando Scandrick in the 1st drive of the game although another was taken 40 yards by James Jones on a slant. All told, against 10 blitzes, the Packers went 5-8 for 121 yards for a QB Rating of 106.25. In addition, there was 1 sack and another pass interference call on Brandon Carr for 31 yards. 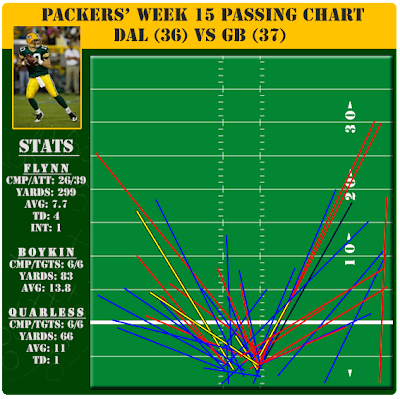 And most damaging, when the Cowboys could not get off the field, they assisted the Packers in moving the chains on simple passes from Flynn to Quarless over and over again to beat the blitz. Here is 3rd and 8 in the 3rd Quarter and you can see that the Cowboys blitz 5 with the idea that George Selvie should handle Quarless 1on 1. Quarless crosses his face with ease and Flynn has to fit a short but accurate pass on the money because Selvie does a pretty solid job of contesting it. 22 yard gain and 1st down on the skinny slant. Here is a 3rd and 6 in the 4th Quarter. Cowboys blitz 5 again and Quarless basically runs another slant against Jeff Heath for 14 yards as Flynn – not know for his arm strength is completing most of his damaging passes between the hash marks right in front of him. Quick throws don’t allow the blitz time to get home and the pass is again on Quarless in a hurry. And then this one, which the Cowboys brought 6 and required both RBs to sort the blitz carefully to give Flynn time. This is the 1st play after the Sam Shields interception so it is highly possible the Cowbys are thinking Eddie Lacy run here on 1st and 10, but instead, another 18 yards to Quarless. 6 receptions for Quarless on 6 targets. They did miss on the 2-point conversion to him against Jeff Heath, but otherwise, the TE who is only on the field because Jermichael Finley was injured was able to have quite a day as the solution to the Cowboys blitz. What is a splash play? Well, for purposes of this blog I believe a splash play will include the following: A sack, a pressure that forces a bad throw, and big hit on the QB, and a batted ball that may lead to an interception opportunity. Again, you can see how this leads to subjectivity, but a subjective breakdown is better than no breakdown at all, I have decided. In addition, a splash play will include tackles for loss, a big hit for a short gain, or a stop which is an open field tackle where a player is pulled down on 3rd down short of the marker because of an exceptional effort from a defender. An interception is clearly a splash play, but so is a defended pass that required a great effort. A major hit in the secondary could be a splash play, but I believe that the outcome of the play will determine that. Sorry, defensive backs, but standing over a guy who just caught a 15 yard pass because you think you hit him hard will not generally pass the test on this blog. So, stop doing it. I am trying to be careful about handing out too many splash plays per game. I am trying to be picky, but too extreme in either direction. When I log a splash play, I will put time of the game on the chart so that if you want to review the same game and challenge my ruling, you are welcome to do so. Also, if multiple players deserve recognition on a single play, we will try to see that as well. 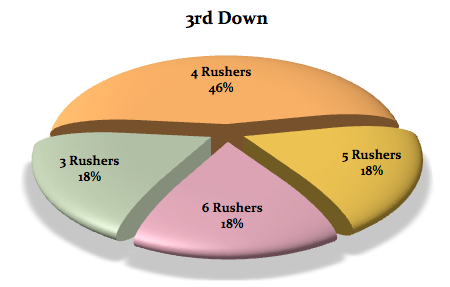 Basically, we are trying to assign a value to making plays on the defense. We don’t want to just see sacks and interceptions. We want to see broader definitions of splash plays to assign credit to those who help the Cowboys get off the field in important situations. These rankings will not deduct for negative plays at this point. There are simply too many occasions where we are guessing, and for now, I want to avoid that for this particular idea. A splash play is a play that makes a major difference in the game. And by keeping it all season long, we will see which defenders are play makers and which are simply warm bodies. We already have our thoughts on both categories, but let’s see if we can dig a bit deeper and actually have numbers to back up our claims. A very nice day for Sterling Moore. Everytime he gets a chance in the NFL, he makes plays. It really makes me wonder why he gets cut so often. I have always enjoyed his work and he continues to get it done now that the Cowboys have called him back again and he stayed ready. Good for him. Here are the final results for 2011 and here are the final results for 2012. This segment of the defensive study is simply to find out how well the Cowboys are doing at getting pressure on the opposing QB. We have spent a good part of the offseason talking about Monte Kiffin’s philosophy that, like so many of the great 4-3 schemes, is based on using blitz as a weapon, not a necessity. If you use the blitz as an ambush weapon that is always threatened but only used at the perfect times, you can often get free runs at the QB. 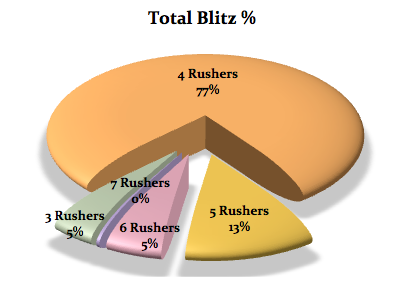 If, on the other hand, you must use the blitz because your normal pressure is not getting it done, then the offense usually is waiting for you and prepared – so even 6 rushers don’t accomplish much. 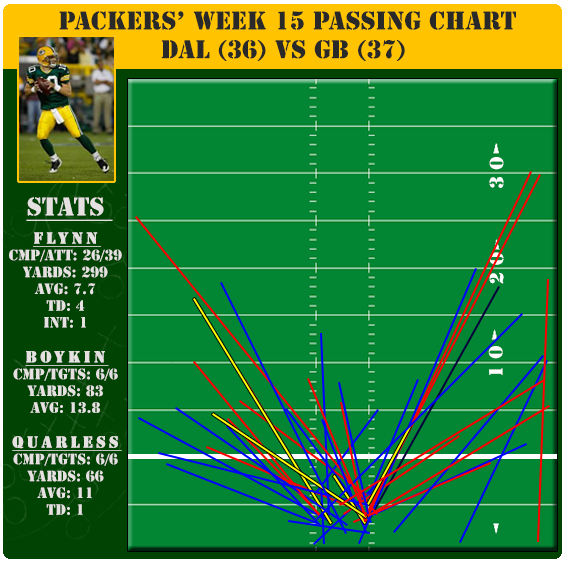 This spray chart for Matt Flynn reveals an old QB truth about dealing with 2-Deep and 1-Deep. Versus 2 deep, look for opportunities behind the linebackers and in front of the safeties between the numbers. But, against a single-high safety, the chances are outside the numbers. 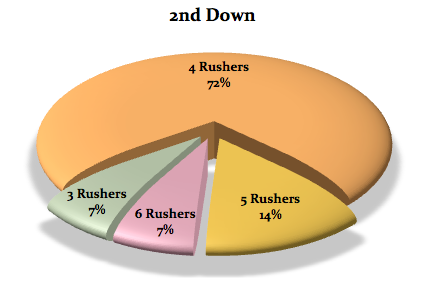 And the Green Bay throw chart will reveal that the Cowboys played a lot of single high – not that Green Bay connected on many of those throws. SUMMARY: There is no question that the defense has degenerated into an unmitigated disaster that continues to make us marvel with its inability to get a single stop in 3 of the last 4 halves of football. They are a shell of themselves and even after a week of big talk and promises from DeMarcus Ware, he was handled well by a 4th round rookie left tackle named David Bahktiari. That gives one pause for the unpleasant choice of either Ware being hurt much worse than we have believed or that perhaps he has seen his best days and now with a cap charge of around $17 million looming in 2014, the Cowboys are going to have yet another unpleasant choice in front of them. The linebacker situation worsens when Ernie Sims and Justin Durant are lost during the game in which they are effecting to replace Bruce Carter and Sean Lee who are also lost to injury, leaving unheralded rookies DeVonte Holloman (6th round) and Cam Lawrence (undrafted) to try to plug the holes, but there is no place to hide them if you are blitzing to get stops. Either they must trouble a pass rush (unlikely) or they must defend on an island (equally unlikely). The coaching has been a legitimate concern at times, but given the dire straits of every department of this defense, save cornerbacks, there seems to be no strategic ideas left in the playbook. Somehow, they need to narrow it down to trying to get 1 takeaway and 1 punt per half. If they do that, they still have a chance to keep the damage down to a winnable margin if we assume the offense can keep its end of the bargain. It is a feeble hope and ridiculous to see back-up QB after back-up QB prove to be too much to deal with, but it is where this thing is. Like beating a dead horse, so is looking at the Cowboys defense week after week. They need to spend plenty of time on this project in the offseason, but the resources are extremely limited moving forward.